Learn the essential concepts of major diseases/disorders and disease processes. 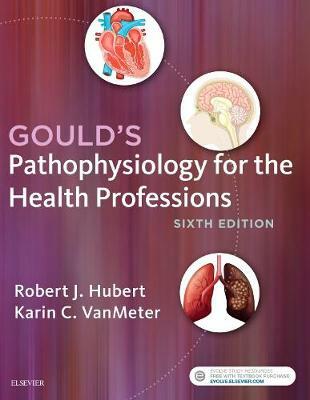 Gould's Pathophysiology for the Health Professions, 6th Edition is a concise, easy-to-understand introduction to the fundamentals of pathophysiology. Continuing in its well-known tradition of readability and vivid, full-color illustrations, the text is updated with the latest research and trends in human disease. Disorders are described by body system, with coverage of the interactions between systems, and special features help you to apply the material to real-life situations. No matter which healthcare field you may enter, this book provides solid preparation for the conditions you may encounter in clinical practice.Updated graphics help you recognize and identify various concepts and specific disorders through enhanced flowcharts, photos, and illustrations. Concise and readable approach includes the information you need without overwhelming you, even if you have a limited scientific background. Format for individual disorder discussions includes 1) background, 2) pathophysiology, 3) etiology, 4) signs and symptoms, 5) diagnoses, 6) possible related complications/disorders, and 7) treatments/research. UNIQUE! Apply Your Knowledge questions ask you to use what you've learned to predict What can go wrong with this structure or system, transitioning you from normal anatomy and physiology into pathophysiology.UNIQUE! Think About questions alert you to important points and help with self-evaluation, test preparation, and review.Warning Signs boxes help in identifying the pre-emptive signs of physiologic events such as strokes.Emergency Treatment boxes give step-by-step instructions to follow for emergencies such as shock, cardiac arrest, and pneumothorax.Research boxes discuss new developments, problem areas of pathophysiology, and complications associated with research.Key terms, learning objectives, and bulleted chapter summaries help you focus on key concepts and information.NEW! All chapters updated to include new data on major diseases and other changes in guidelines and the literature, reflecting latest developments in pathophysiology including, updated drug therapy content, expanded coverage of viruses, new cancer treatments, new research on the links between mental health and biochemical/physiologic factors, and much more!NEW! Streamlined narrative content enhances the readability of imperative information.